Click here for more information about the forums. Congratulations to Adam and Taryn on the publicity! Architectural Review Commision, Variance Review Board, Historic Preservation and Hillsborough Planning Commision. Article in St Pete Times describing the development of the Oliva Cigar Factory. Originally the factory was planned to be an artist enclave. For some reason the owners later decided to sell. This did not sit well with the artists. and they are making their voice heard. Other than the artist enclave, a hotel is a good answer for this building. However, the City of Tampa is increasingly making it more and more difficult for developers to invest in infill properties. Another Barrio meeting, another council meeting, this takes time and money, no wonder developers choose to invest money in the outer regions of Tampa Bay. And why are we one of the most decentralized cities in the nation? There are so many empty buildings in Ybor, becuase the city no longer wants bars, but offers no incentives to invest for offices, restuarants, hotels, or other uses. can be found here. Some really good ideas and some ...well... ideas. It seems as though every group wanted the same things, mixed use communities, preserve natural resources and better transportation corridors. The true reality check is actually getting it done without ruining the vision through politics. Didn't we vote 6 years ago for the high-speed rail? Wasn't the Tampa Orlando corridor supposed to be completed by now? The presentation will also include information on future events and workshops. The cost is only $25 for non-members and is at 7:30 on August 29th at the Maestro's inside the Tampa Preforming Arts. This is a great way for architects to shape the future of Tampa Bay rather than question why the city is so dysfunctional. Hope to see you there. I just watched the Gregg Pasquarelli (from SHoP Architects) lecture from the Harvard podcasts link below during my lunch break. I highly recommend that everyone check it out. He of course talks about some of their terrific projects, but more interesting to me was his discussion of the future of the profession. He discusses the typical relationship of architect + contractor + developer and the harm that it has done to the profession in marginalizing the architect. He posits a new way for the profession which returns the architect to a position of power. They have now started having ownership or equity positions in about 6-7 of their projects which has allowed them more design freedom. Finally he discusses near the end of the lecture about how they have received an investment of $200 million from Wall Street to pursue their new pattern for the profession. He also throws in a bit of AIA bashing for good measure. Check it out and post some comments below. How is BIM going to effect the future of the profession? Also, obviously we can't all get $200M investments, but how can we gain equity in our projects? Are their other ways to return the architect to a power position in the building industry? Interesting article in the Tampa Business Journal. A group of "creative" thinkers are banding together to come up with ideas to transform MacDill park in downtown. Macdill Park is just South of Kennedy and north of Whiting, on the Hillsborough River. The parcel is known as Section 12 of the riverwalk. Unfortunately, the Biz journal requires a subscription to view the article, but here's the link with a quick abstract. The full article was published on another blog found here. 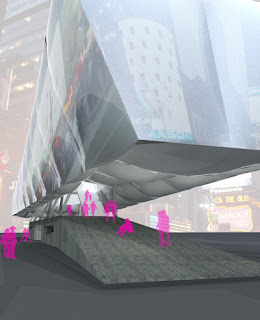 The idea for the park is similar to Bryant Park in NYC with infrastructure for multi-media events. It looks as though it is something that e-tba could help them out on. I'll try to contact them. 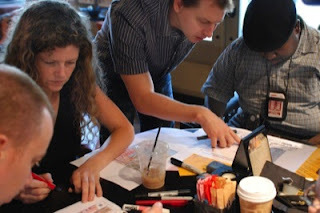 Sketch-up training is coming to Tampa on 08.29 and 08.30. Training is at TechSherpa's in Ybor. $300 for a 3 hour class, seems completely reasonable. Try to get this one expensed! Will the TMA be green? Harvard's Graduate School of Design has a library of video podcasts of their lecture series. They will also stream their lectures from this year's series. 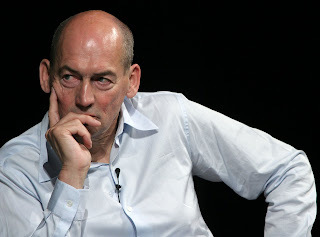 The lectures available include Rem Koolhaas (pictured), Jeff Kipnis, Ben Van Berkel, and David Adjaye, among many others. 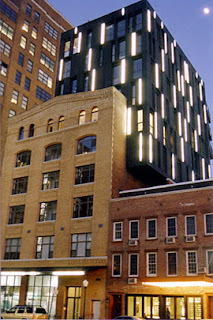 This year's Architectural League NY Young Architects include PARA (whose Times Square Recruiting Center project is pictured to the left), Productora, UNI, and Ludens. The Architectural League has posted podcasts from each of the honorees. 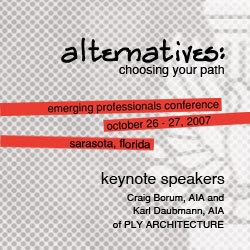 Also, in the 2006 Young Architects section, you can also check out an interview of Craig Borum and Karl Daubmann of PLY Architecture, the keynote speakers at this year's EP Conference. There are also podcasts of lectures by such luminaries as Renzo Piano and Bob Stern. Also, if you're interested in sustainability, be sure not to miss the "Architecture and the Environment" podcast from Bill McKibben, the author of the landmark book "The End of Nature". Be sure to check out the Emerging Professionals Design Problem brief while you're there. The projects will be juried by the aforementioned keynote speakers. This year's design problem focuses on the development of a prototypical light rail system for the Sarasota region. 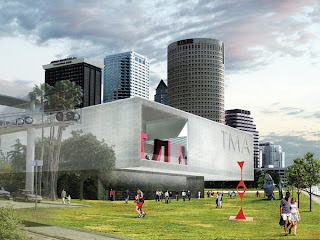 The approval of our very own Tampa Museum of Art is featured in the news section of this month's Architectural Record. And, if you haven't seen all of the renderings yet, you can check them out here. What do you think about the design so far??? Is is fantastic? Is it lackluster? finally e-tba blog site has begun.